Wolfurt, Austria – The countryside around the village of San Juan Sacatepéquez in south-eastern Guatemala is hilly and forested. Cementos Progreso. had been planning to build a new cement plant there for some time. Among other things, the project required a solution to transport limestone and marl from the crusher to the processing ​plant. Cementos Progreso opted for Doppelmayr RopeCon as a means to cover the distance of approx. 1.6 km and the vertical rise of almost 200 m.
The San Gabriel cement plant is located some 35 km northwest of Guatemala City. There the Guatemalan company Cementos Progreso, S. A. produces some 2.2 million tons of cement every year for the local market. The limestone needed for the process is mined in a quarry located approximately 200 m lower than the cement plant. The terrain between the crusher in the quarry and the plant is hilly and wooded and stretches over a distance of approximately 1.6 km. By using RopeCon to transport, Cementos Progreso is able to cross that terrain in a straight line despite the difficult topographical situation. By using RopeCon® to transport the limestone between the crusher and the processing plant Cementos Progreso, S. A. is able to cross that terrain in a straight line despite the difficult topographical situation. This means that a gradient of 22° is reached where the terrain is steepest. Because the RopeCon® belt is fitted with axles with running wheels at regular intervals, no additional cleats were required to tackle that gradient. RopeCon® has now taken up operation. The material is loaded onto RopeCon® by a feeder conveyor and unloaded at the unloading station via a housed-in chute. The system transports 2,100 tons of limestone and marl every hour to cover the demand for the cement production. RopeCon® is a product developed by the Austrian ropeway manufacturer Doppelmayr. 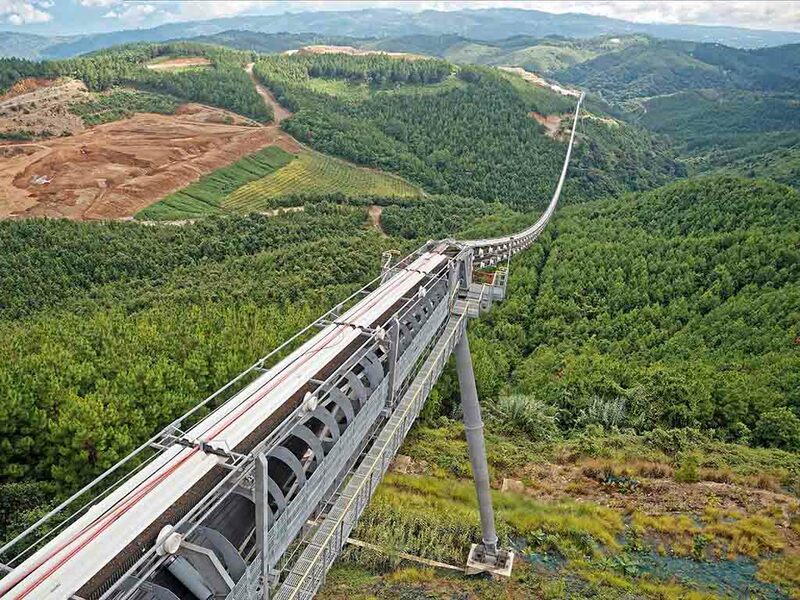 It offers the benefits of a belt conveyor as well as those of a cable car by successfully combining what is best in both technologies. The system is currently in use for a variety of material transport applications. It essentially consists of a cross-reinforced continuous flat belt with corrugated side walls which is driven and deflected by a drum in the head or tail station. The belt is fixed to axles arranged at regular intervals, which support the belt. Running wheels are fitted to either end of the axles. These run on track ropes with fixed anchoring and guide the belt. The three track rope pairs form the line structure for the system and are elevated off the ground on tower structures. The system therefore requires only a minimum of space on the ground and is ideally suited for difficult terrain and to cross obstacles of all kinds.